PayUmoney is a complete payment gateway solution for your online business. We help online businesses collect payments from their website, mobile app or through shopping carts like Shopify & ecommerce plugins like Magento etc. 3.5 lac+ businesses in India use PayUmoney payment gateway to collect online payments from their customers directly into their bank account. No, PayUmoney is not a wallet. We are a payment gateway for online businesses helping in collecting payments from their customers. We do have a UPI based mobile payment app - Citrus, enabling peer to peer money transfer directly from bank account. Explore the "Citrus" app here. Enter the required details and click on ‘Create Account’. Explore - You can explore and test all the features & do a demo transaction before you even integrate with us. Complete Profile - Here, you need to fill in all your personal, business and bank details to get payments from customers automatically in your bank account. Please note: Although you can start collecting payments just after sign up, money will be transferred to your bank account only after successful bank verification. Learn more about "How To Verify Your Bank Account On PayUmoney" through this video. With PayUmoney, you can start collecting payments right away after sign up. Yes, it’s that simple! To get money transferred into your bank account, you need to complete your profile and verify bank account. Learn "How To Verify Your Bank Account On PayUmoney" from this video. Kindly note that the transaction amount is limited to cumulative of ₹50,000 till your website gets an approval. No, you can set up an account with us without the GST number. Please note that you’ll not be able to get benefit on input credit on taxation of service charges till your GST number is not submitted with PayU. Once you fill in your business details, you will be able to share your GST number via the PayUmoney Dashboard. Yes, we support International payments and multiple currencies. The approval for the same is subject to the proper documentation and is solely based on the discretion of our banking partners. To enable this, kindly drop in a request via our contact us page. Please select ' Transaction Related’ in the Issue type dropdown. We will be happy to help you. Please note: If you are registered as an 'Individual' with PayUmoney, you will not be able to set up International payment gateway. Unfortunately, you cannot add multiple websites in a single account. For each website, you will have to create a new account on PayUmoney. PayUmoney Payment Links – Collect payments directly from the PayUmoney dashboard. Just generate payment links and share it via multiple platforms like Whatsapp, Facebook, SMS and Email. Your customers can pay using their preferred option: Debit Card, Credit Card, Netbanking, UPI and Wallet. Webfront & Webstore – Want to sell online but don’t have technical resources to build a website? Showcase your product/service, NGO or an event by just entering details like image, description in a ready to use template. All this along with an inbuilt payment collection capability. Yes, we do allow EMI as a payment option. The approval for the same is subject to the proper documentation and is solely based on the discretion of our banking partners. To enable this, kindly drop in a request via our contact us page. Please select 'Transaction Related’ in the Issue type dropdown. We would be happy to help you. Yes, you can still sign up and collect payments with PayUmoney. Please select ‘Individuals’ as your business entity while filing the business details section. Yes, we have ready to use customizable Android & iOS SDKs to help you collect payments on your mobile app. 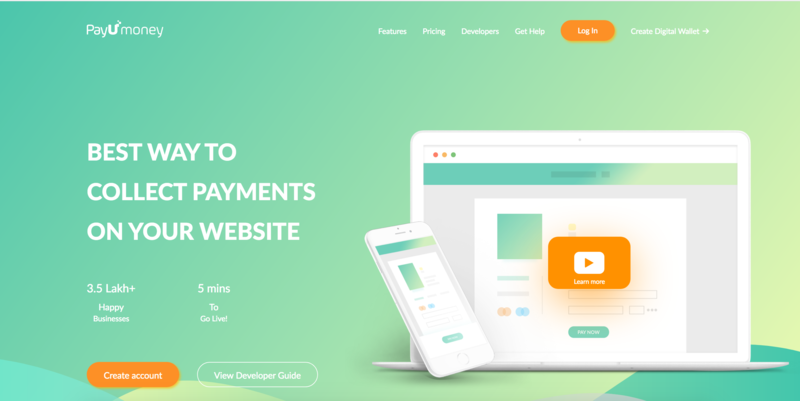 Check out PayUmoney Developer Guide to know more. Yes, in case you are an individual running a business, we do support ‘Savings’ bank account type. For non-individual business types, you will have to enter 'Current' bank account details.